*David Letterman is known for raking his guests and potential guests across the coals to get a rise out of them and a laugh out of his audience. But, this time it seems that someone is dissin’ him and ignoring Letterman’s attempts to get him on the show. Once again, David Letterman has gone over the line. Not that I saw this as I have eliminated the David Letterman show from my late light viewing. He (and his writers) have gone beyond “his job” of entertaining viewers and become campaign enthusiatics. I encourage all late night viewers to return to enjoyable entertainment with any other show. David Letterman needs to return to his original “job” as entertainer and leave politics to the politicians. Unless he would like to campaign for himself.. I think Dog Catcher is open in Podunk City. He can improve the economy there with his own campaign. Whoops, his questionable ethical past may come into question even there. Dave, what material are you going to have after November? 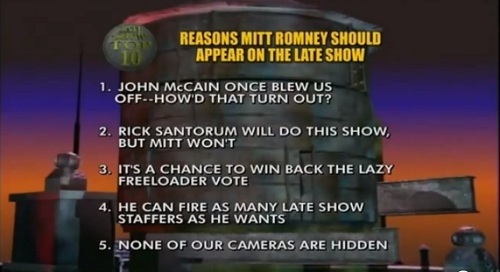 Top Ten suggestion, Ten reasons Not to Watch the Letterman Show…Stay tuned..